I've been having cravings lately for a delicious tiramisu (one of my favourite desserts) and decided I should attempt to make a LCHF version myself. I'm extremely pleased to say it was a roaring success! Method Preheat oven to 170°c. Cream xylitol, butter and egg yolks in a mixer until light and fluffy, add all other ingredients except the egg whites and mix till combined. In a clean bowl whip egg whites until they form soft peaks. Next fold 1/3 off the egg whites into the batter, then repeat this step two more times till all ingredients are combined. Be careful not to knock the air out of the egg whites. Place batter into a lined, greased cake tin (mine was approx. 12cm x 20cm) and bake in oven for 25-30mins. You can see how light the sponge turned out... Perfect to absorb all those decadent upgraded coffee and Kahlúa flavours. So to creating the Bulletproof Tiramisu. I made 1 cup of strong Upgraded Bulletproof Coffee and set aside to cool. Next I whipped 125ml of pure cream until nearly whipped. To this I added 250ml Mascarpone Cheese, a splash of Kahlúa, 50ml of the cooled coffee, a few drops of liquid stevia, a cap full of MCT Oil, and a little vanilla then I whipped til combined. All that's left to do then is assemble. 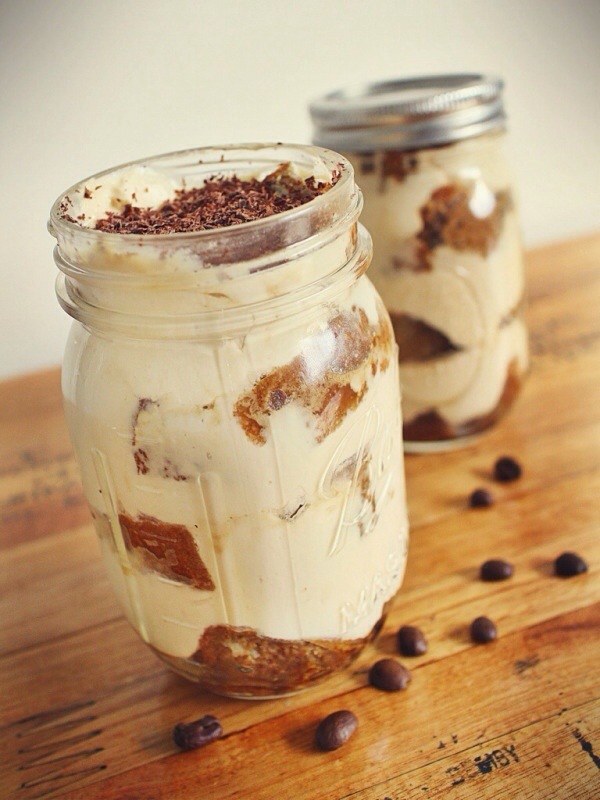 I sliced the sponge cake into 1cm thick fingers, dipped them one-by-one into the coffee (which I also added a splash of Kahlúa to) and simply layered the fingers alternately with the cream mix and placed them into mason jars. Topped with grated dark chocolate and refrigerated for a day to let the flavours combine and infuse.